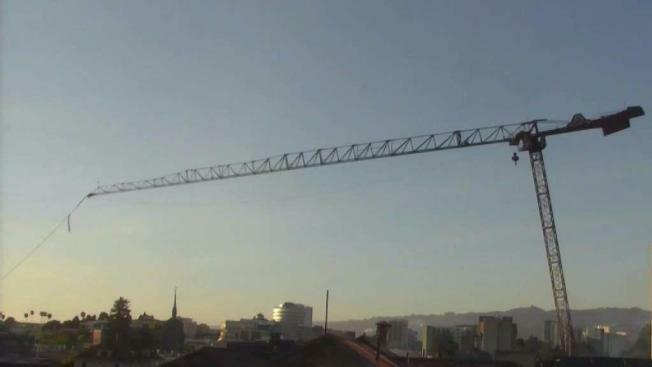 Crews on Saturday successfully tore down a crane that was damaged by a fire at an under-construction apartment building in Oakland. Sergio Quintana reports. 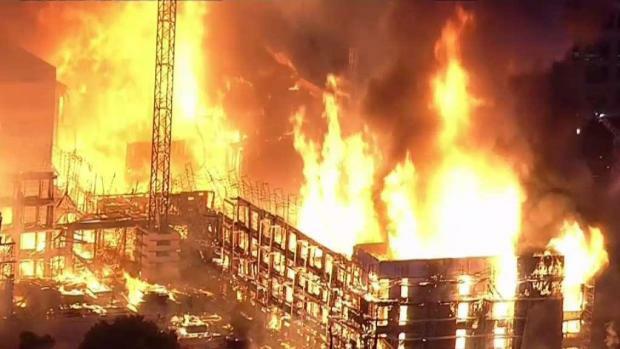 Flames and smoke that could be seen for miles destroyed an under-construction Oakland apartment building Friday, forcing hundreds of residents from surrounding buildings and frustrating officials struggling with an acute housing shortage in San Francisco Bay cities. There were no injuries in the fire at the seven-story building, which had been due to house 196 families at market rates when it was completed next spring, according to the website for the project. The blaze scorched the outside walls of nearby buildings and sent a giant crane on the construction site wildly spinning for a time. Fearing the crane would collapse, authorities ordered at least 700 people out of buildings nearby and made firefighters themselves retreat temporarily, acting Fire Chief Darin White said. Fortunately for the public and crews working at the construction site, the damaged crane was successfully dismantled Saturday just before 7:45 p.m. As a result, most of the evacuees were given the green light to return their homes. Flames and smoke from the massive blaze were visible at least eight miles away across the bay in San Francisco. "There was this enormous jet of fire," said Mark Ciana, who watched the fire from a commuter train. "It was kind of horrific to see a fire of that scale." Cianca saw families near the site fleeing the blaze, which began just before dawn and burned until the end of the morning rush hour. "They had their pets, and whatever they could carry. It was sad, horrific, and confusing, all at once." Retail businesses also had been planned for the now-destroyed building. The Bay Area has some of the highest housing costs in the nation, contributing to a 39 percent rise in homelessness in the past two years in Alameda County, which includes Oakland, officials said. Nearly half of those newly homeless are African-American. 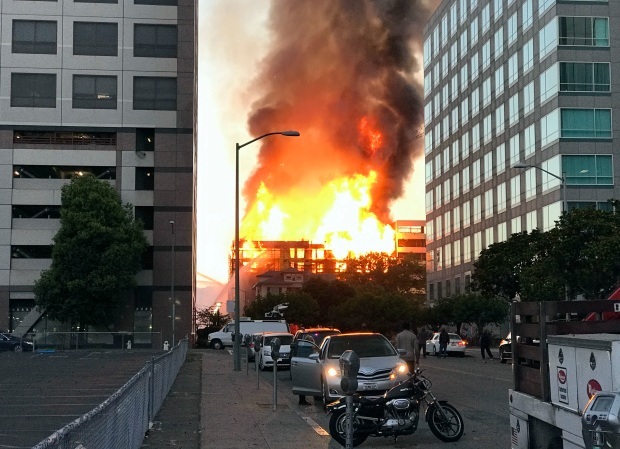 Over the past two years, arson has consumed two mixed-use buildings in Oakland that would have included housing as the projects were under construction, Mayor Libby Schaaf told reporters at a news conference Friday. On Dec. 2, fire at an Oakland warehouse illegally converted into housing killed 36 people at a party there and became the United States' deadliest fire in years. While authorities do not know the cause of Friday's fire, Schaaf called the cases of arson "disconcerting." "Oakland is in the middle of a housing crisis and the loss of these valuable units only exacerbates it," she said. Flames and smoke that could be seen for miles destroyed an under-construction Oakland apartment building Friday, forcing hundreds of residents from surrounding buildings and frustrating officials struggling with an acute housing shortage in San Francisco Bay cities. Sergio Quintana reports. Before allowing residents to return to parts of the neighborhood Saturday, engineers spent several hours calculating exactly how to pull down the unstable crane, according to Fire Battalion Chief Erik Logan. Cables were eventually attached to machinery on the ground, and the crane was toppled in a matter of seconds. "It played out just the way crane engineers wanted it to work out," Logan said. Once the crane was toppled, city officials coordinated with PG&E to restore power to the buildings that were evacuated. A few buildings near 24th and Waverly Streets remain off limits to residents as of Saturday night. The structures may have been damaged by the blaze, and inspectors need to check to see if they are safe. The Alameda County Arson Task Force and the federal Bureau of Alcohol, Tobacco, Firearms and Explosives are investigating the fire. They are expected to continue to collect evidence to determine if the blaze was arson or not.